We’re sure you will agree, there’s no better way to relax than to sink into a soapy tub. Book a spa bath for your dog the end of the stay and be reunited with a fluffy, clean and happy dog! Bath (shampoo/conditioner), towel dry, blowdry and complete brush out. Our spa uses premium dog shampoos and grooming products made by Happy Tails Canine Spa in California. Please note that we no longer offer grooming services. 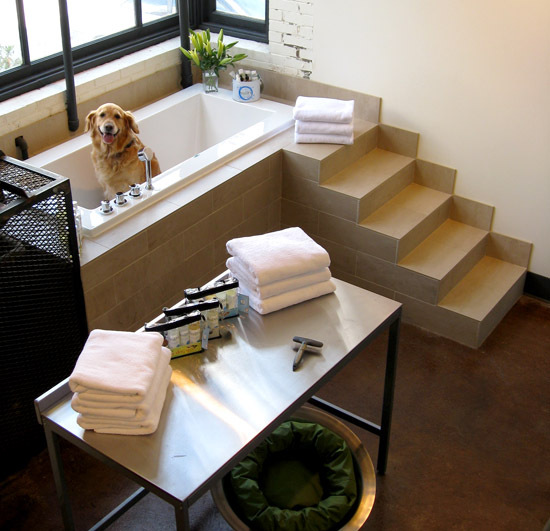 We want your dog to have positive associations with the hotel and be excited to come and stay here with us. Unfortunately many dogs do not enjoy getting groomed so we now offer wonderful spa baths only.